Well, it’s that time of the year again, when we look back on 2014 and pick our favorite this or that in blogland. And since I write about accessible travel, I’ll share my favorite accessible travel memory of the year. That’s a lot harder than it sounds though, as we’ve had a super busy travel year. But since a decision has to be made, I’m going to go with the Huttopia Tent we stayed in at Parc national d’Oka, in the Canadian province of Quebec. 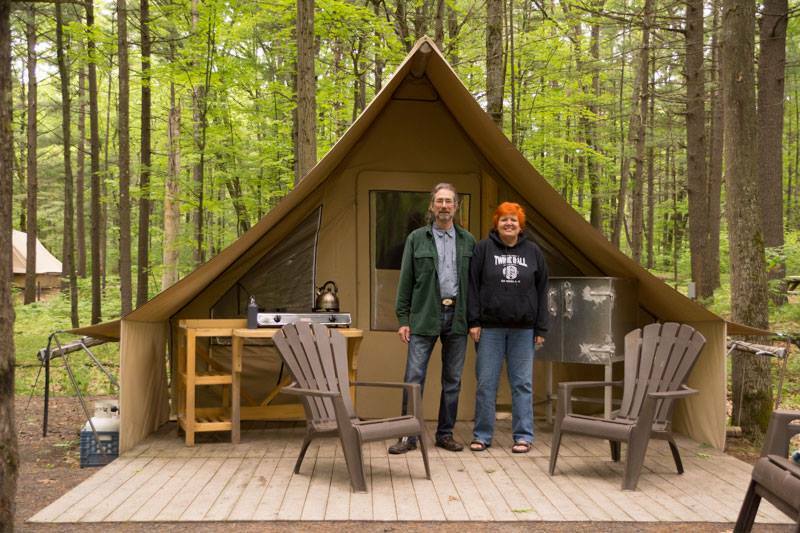 The wooden-floored tent is more than comfortable, with level access and a covered front porch. Inside there is a table and four chairs, a small refrigerator, a coffee pot and a nice assortment of pots, pans and dishes. The two beds are 20-inches high, and as an added bonus, the tent is heated. It even has a gas grill on the front porch. Plus it’s located just a short walk from the accessible shower and toilet facilities. Truly we were quite comfortable there, and it was a nice quiet campground. Plus with some accessible trails nearby, there are plenty of things to do. So even though the mossies were pretty thick there, Parc national d’Oka still gets my vote as my favorite accessible travel memory of 2014. And I’m looking forward to making even more accessible travel memories in 2015. This entry was posted in Lodging, Recreation and tagged camping, Canada, huttopia, Quebec, wheelchair by Candy B. Harrington. Bookmark the permalink.